Major news for fans of Major Crimes. TVLine reports TNT has ordered eight more episodes for the series’ fifth season. 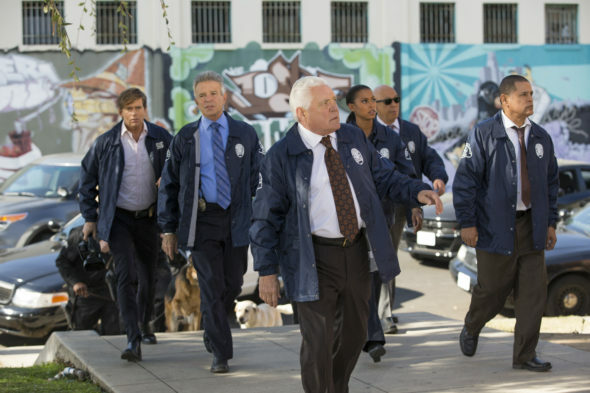 The police drama centers on the Major Crimes division of the LAPD. The cast includes Mary McDonnell, Tony Denison, GW Bailey, Michael Paul Chan, and Raymond Cruz. The fifth season just premiered earlier this month. Instead of 13 episodes, now the fifth season of Major Crimes will contain 21 episodes. The extra order might be due to decent ratings. Only two episodes in, season five is receiving an average of .44 in the 18-49 demo and 3.64 million viewers. The next episode airs on June 27th. What do you think? Do you watch Major Crimes? Are you excited for more episodes? Great show. I was a fan of the Closer but this is high on my favorite list too. I would love to see Brenda come back and finish Philip Stroh once and for all. The characters have developed so well and I love the fact that they are also mature with real-life issues. Respects the intelligence of its audience. Everyone I’ve recommended it to, loves it. Steady shows draw steady audiences. Please renew!